A.F. Bennett Salon & Wellness Spa is a retreat for personal renewal for the body, mind and soul. Dads-To-Be enjoy a deep tissue massage, private herbal steam shower, sport pedicure with reflexology and more as part of "The Gentleman" package. Oasis combines a peaceful and beautiful environment, with a highly trained, friendly staff, to ensure you a memorable and enjoyable spa experience. 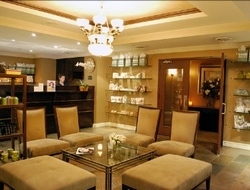 The Mom-to-Be Package includes a pregnancy massage, 30 minute body scrub and customized mini facial. The "Men's Getaway" package offers Dads a classic men's facial, Muscle Meltdown massage and 30 minute body scrub.